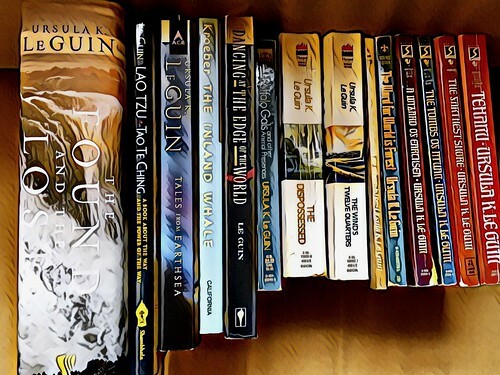 Because it’s January and my brain is currently soupy, when I made my list of literary ancestry I somehow missed Ursula K. Le Guin, which was a huge oversight on my part. I don’t know how I could have missed her. 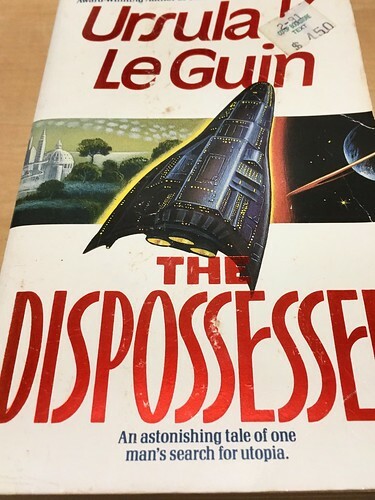 Much like A Wrinkle in Time, Le Guin’s The Dispossessed left an indelible mark on me. I don’t think it was the first thing of hers I read, but it’s the first thing of hers I remember. Like Wrinkle, it turned my world inside out. It fundamentally changed how I thought of the world, how governments and societies functioned and how they could function. I learned about anarcho-syndicalism here. The following year I would write an essay for the local Optimist Club on the topic, “Freedom, Our Most Precious Heritage.” I remember writing about three freedoms, and how limited they were depending on who you were (this was my attempt at a proto-feminist analysis). I concluded my essay with a statement about things ending in anarchy, which in my mind meant an egalitarian, non-hierarchical society. My father read it as chaos, which is the general reading. Somehow I got second or third place in the contest, which meant I had to read the essay out loud, to the Optimists. The only women/girls in the room were me, my teacher, and the mothers of the two other winners (both boys). After the event I think I had to shake the hands of the Optimists, and many of them told me I was brave. I couldn’t figure out why until I went home and re-read my essay. I had talked about economic inequity and women getting paid 73 cents to every dollar a man earned, among other things, to a room full of white men. Tenar sat silent, but unsatisfied. At a time when it felt like men had a lot of power, and honestly, still do, I found and find comfort in Le Guin’s visions. I also see her humor, which I had missed when I was younger. Only a resident of the Pacific Northwest could venerate the blackberry bramble in this manner. Her nonfiction has been equally powerful, most notably the essays contained in Dancing at the Edge of the World. I want to make a short digression by noting that the image below contains a book of stories written by her mother, The Inland Whale. Additionally, she did her own translation of the Tao Te Ching, which I studied as part of my major in college. Her work runs like rivulets throughout my own life, as I meander and wander and time and again come across her work. Also not pictured, because I keep forgetting I have yet another book, is Steering the Craft. You can listen to her talk about it in the podcast Between the Covers. David Naimon interviews her, and it is wonderful. I kept wanting to stop and write things down. There are two other interviews he did with her that you can also find on his site. She knows, though she won’t admit it, that Dr. Kissinger has not gone and will never go where she has gone, that the scientists and the shamans have not done what she has done. Into the space ship, Granny. She created space for women and gender minorities, and she did this work in so many ways throughout her life. I’ll end with this speech she gave upon receiving the National Book Foundation’s Medal for Distinguished Contribution to American Letters at the 65th National Book Awards on November 19, 2014. This entry was posted in Writing and tagged feminism, people on January 28, 2018 by slowbloom.